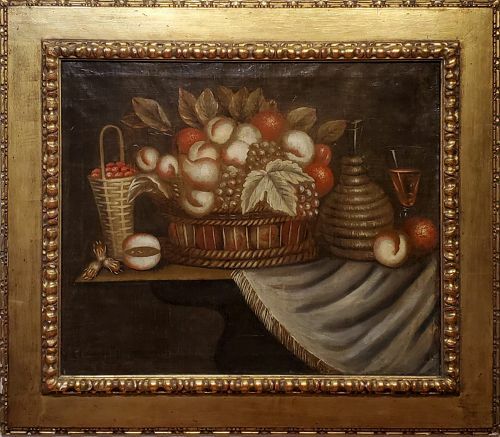 Oil on canvas, approx 13" x 16" Unsigned but attributable... I would say circa 1950-60. 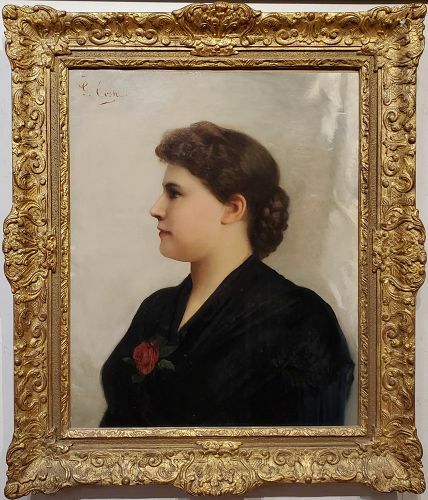 Miss L. Hazlewood Wakefield, British, early 20th C.
25" x 30" and 30" x 35" framed. Signed and dated "Hazlewood L. Wakefield 1895" lower right. Exh. 1916-21, twice at Royal Academy according to "The Dictionary of British Artists 1880-1940". Oil on canvas, 18" x 24" canvas size. Approx 23" x 30" in the frame. Fully signed but most Danish makers not well known or researched. 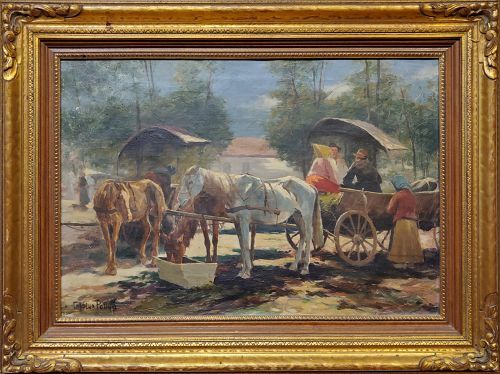 Oil on canvas, approx 13 .5 x 19.5" Horse cart. signed. Oil on wood panel, 10 3/8" x 16 1/8" panel size., signed. Guiseppe Costa, Italian, born 1852. Oil on canvas, approx. 25" x 20" and framed 32" x 26"
Oil on canvas, inscribed "A. Solomon Esquire" on stretcher. This work depicts a theatrical rehearsal of Othello. 12" x 14" in the frame and 8" x 10" canvas. Unlined. 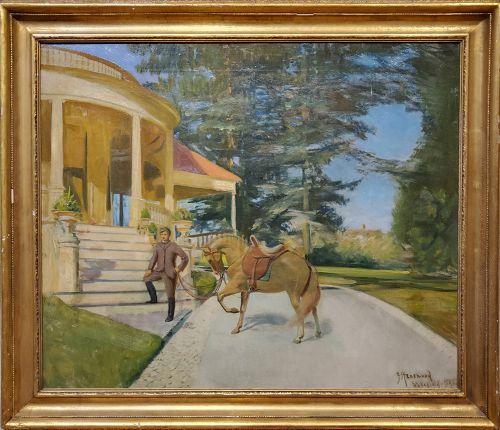 Oil on canvas, 25" x 30"--depicting pony and setter in front of elegant estate. Believed to be a William Barraud. Barraud was an english animal painter and illustrator, the brother of Henry Barraud, with whom he collaborated on many works. 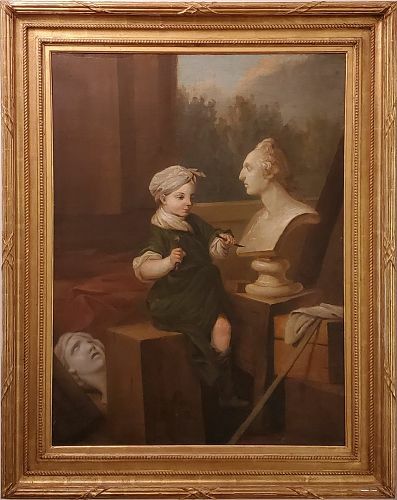 Possibly Henry Barraud's work, but believed to be a William Barraud, because style and subject matter match William's tendency to include a horse accompanied by a dog in his work. 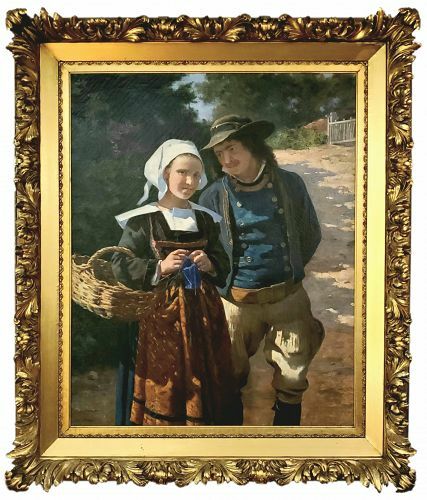 Beautiful, large painting depicting a Brittany couple. Deschamps lived and worked in France 1846-1902. Approx. 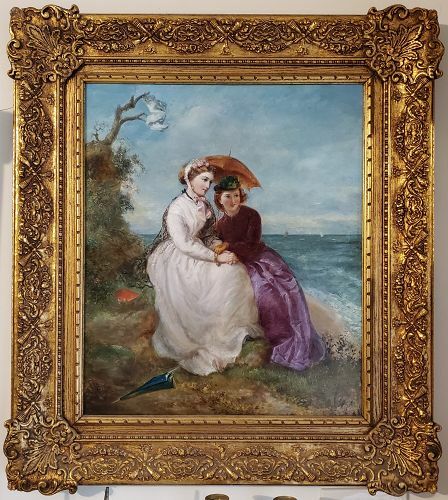 59.5" x 51"
26" x 22" oil on canvas, signed lower left and dated 1868 and in frame, 36" x 32"--Striking Victorian image of women at the sea shore. MacLeod is listed in Wood's Dictionary of Victorian Painters and exhibited 82 paintings total at Sussex Street, the Royal Academy and at the Royal Society. 25" x 29.5". 35" x 40" in frame. Oil on canvas. 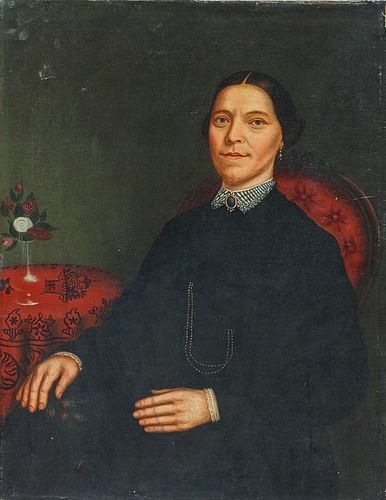 Western, probably British portrait of a Chinese woman circa 1865-80. 36" x 28" rare portrait. approx 40" x 30" signed lower right. In custom Roma molding, total dimensions approx. 48" x 38"